The Schools Recycling Project, run by The Waste Trade Company, was implemented in 2009 and has since grown to service over 280 clients in Port Elizabeth, Despatch, Uitenhage, Colchester, Kirkwood and Addo. The majority of these clients being schools, but churches and nonprofit organizations are welcome to participate as well. The project has shown considerable growth in the last 4 years, 2016 being the year with the highest average volumes per month. “Anyone who follows us is aware of all the exciting initiatives we have to motivate all participants to recycle. We believe that our future lies in the hands of our children, and therefore we are committed to making this project sustainable,” says Kay Hardy, General Manager of The Waste Trade Company. New entrant, Molefe Primary, won second place for the last term of 2016, with a total weight of 5738kg of recyclables. “What, we came second? !” exclaimed a very surprised Mrs Nomalunga Kwatsha, a school teacher and the organiser of the enviro club, “wow, we are so happy!” Principal Xola Rasi was very grateful for the R2000 prize money, donated by Mpact Recycling SA, “the money will help us relieve our paper shortage, so we can start the year on a good note,” Mr Rasi also advised other schools on how to make a recycling project work; “motivation and education is key, remind and encourage the learners, and involve the parents!” Molefe Primary also manages their own vegetable garden, which is used toward meals for the learners. They intend keep winning in order to purchase a water tank for the school. Uitenhage based school, Albertyn Primary, won third place with a total weight of 4533kg. 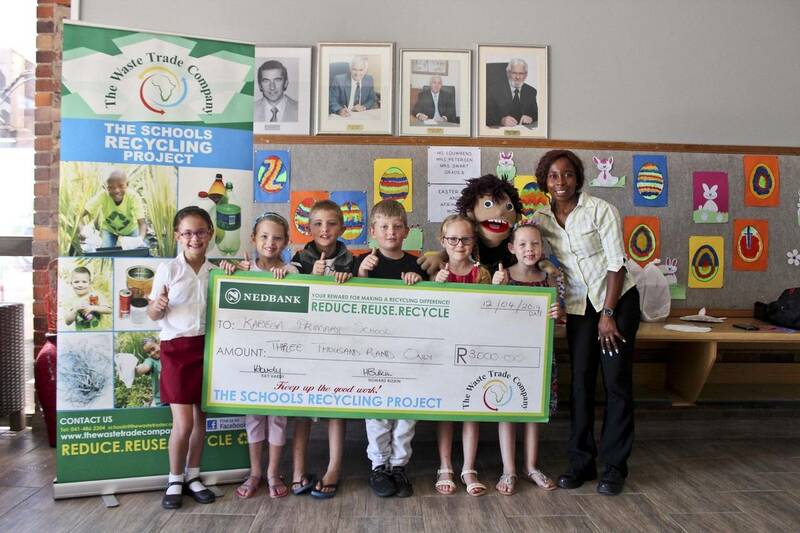 The school won a cash prize of R1000, donated by Mpact Recycling SA. “We worked very hard to collect and sort all our recyclables, especially in December, we had a whole classroom full,” says Mrs Huiskens, teacher and coordinator of the recycling “but you are only as strong as your team, many hands make lighter work”. With the help of The Waste Trade Company, the school plans to upgrade their recycling facilities so that they can start fresh with the new enviroclub learners this year.